Offered is a very scarce example of the work of Delaware silversmith and clockmaker William F. Robinson (b. 1810 - d. 1849), who worked briefly in Philadelphia in the 1830s, and then spent the last decade of his life working in Wilmington. Silver bearing his mark is uncommon. 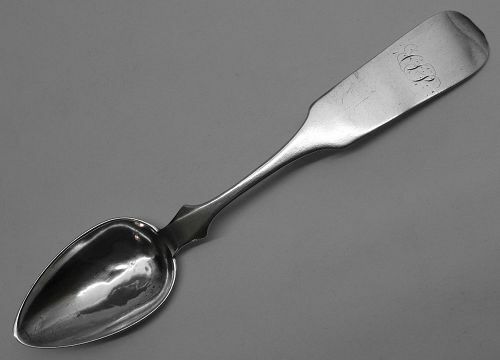 This teaspoon bears a rubbed but legible maker's mark of W.F.ROBINSON in a rectangular punch, and has an engraved period script monogram. It measures about 6 3/16 inches in length and weighs about 18 grams. Condition is fair, with some modest ripples to the handle and dings to the bowl, but no splits or repairs. All in all a nice piece by a scarcer Delaware maker!